Bangkok (CNN) -- Yingluck Shinawatra was poised to become Thailand's first female prime minister Sunday after her party won a majority of parliamentary seats in the nation's general elections. The official tally had not yet been completed, but with more than 90 percent of votes counted Sunday night, Yingluck's Pheu Thai party had won 262 seats in the country's 500-seat parliament. "The first thing I want to do is help people on their economic situation," she said earlier Sunday, refusing to declare victory until the official count was over. Minutes before, Thai Prime Minister Abhisit Vejjajiva conceded that she had won. Yingluck is the younger sister of one of Thailand's most polarizing political figures, former Prime Minister Thaksin Shinawatra who was ousted in a 2006 military coup. Two years later, he left the country after being convicted on conflict of interest charges -- accusations that he still denies. Flags with his image waved in the sticky night air outside the Pheu Thai headquarters. A child wearing a shirt with his sister Yingluck's picture on it walked past them, trying to get closer to the celebration outside. Yingluck's critics worry she will simply do her brother's bidding -- something she has denied. Before she even gave her victory speech, her brother shared his comments from exile in Dubai. 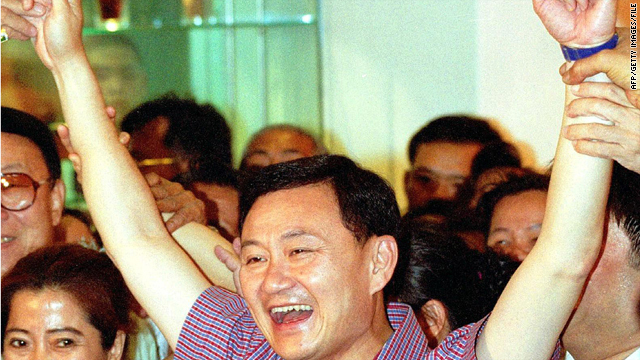 "Well, I would tell them that I really want to go back, but I will wait for the right moment and the right situation," Thaksin told reporters. The Pheu Thai party remains fiercely behind Thaksin and wants him to return. The so-called "Yellow Shirts," a group that formed to oust Thaksin from power, will do whatever they can to stop that from happening. What does his sister say about all this? CNN asked her three days before the election. "I can't do anything special for my brother so as long as if my brother will be every process we will follow by the rule of law," Yingluck said. With about 47 million eligible voters in Thailand, Sunday's balloting was held to decide Thailand's first general election since 2007, an election that many hope will bring an end to years of unrest between two political factions that climaxed last year with protests that turned deadly. "There is a lot more hard work to do in the future for the well-being of our sisters and brothers, the people of Thailand," Yingluck said Sunday. "There are many things to accomplish to make reconciliation possible, paving the way for a solid foundation for a flourishing nation." Tensions between the Democratic Party and the Pheu Thai party, which reflect deep divisions within Thai society, erupted last year, with protests against Abhisit's government leading to a military crackdown. More than 90 people were killed and hundreds were injured. After the riots, the Thai government pledged to work toward a process of national reconciliation to heal class and political divisions, though the divide between the two groups remains wide. But average Thai voters were more concerned with economic issues, wanting their leaders to shrink the gap between what they earn and the skyrocketing cost of living. 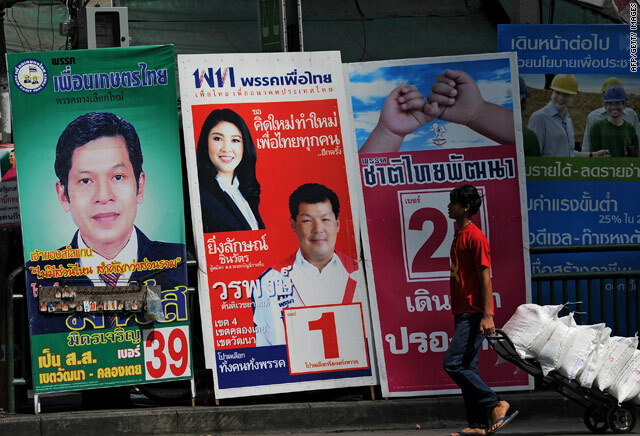 Thai election makes history but can winners keep promises? "Free education is good, care for elderly is also good. In fact every parties' policies are all good, the question is if they would ever implement them." Banorn Achriyawatkul said as she worked outside a polling station. After being laid off from her job as a secretary, the mother of four is now a food vendor in the streets, trying to make ends meet. Despite the animosity between them, the two major parties have made very similar promises to the people: a better economy, free education, and a major increase in the minimum wage -- exactly what many voters wanted to hear. But analysts say the extravagant programs will cost more than Thailand can afford. Supong Limtanakool of Bangkok University's Center for Strategic Studies said both parties made big promises they just can't keep. "It will be something that we have to spend somewhere between an additional 1.5 trillion baht to 7.5 trillion baht (49 billion dollars to 244 billion dollars) with all the extravagant programs, which is five times the national budget. ... I mean, we'll be broke in one year," he said. CNN's Kocha Olarn and Benjamin Gottlieb contributed to this report.